Sales is Not B2B or B2C. It Is Always 1to1. What does your sales funnel look like? Regardless of whether you’re in B2B or B2C, we can’t lose sight that the sale is not made until it’s 1to1 — one person connecting with one person. Only when we get to the one-to-one conversation will we be in a situation to understand what the customer is looking for and how we can assist. The stronger our one-to-one communication, the better the price we’ll be able to command. Too many discounts are given because we have not had the level of dialogue we need to be having. The problem of not having strong enough one-to-one dialogue begins with how we view sales leads and prospecting. If all we’re doing is trying to gather as many leads as possible, we’ll never have the time to go deep enough in a one-to-one relationship with our best prospects to understand their needs. In my work with companies, I see this problem all the time. I don’t care how many leads a salesperson has. In fact, too many leads will wind up hurting sales and especially profitability. If all we’re doing is servicing leads, then how will we ever have the time to go one-to-one with our best opportunities? A goal I challenge salespeople with (and I do get push back on it from some sales managers) is to measure the amount of time you’re spending with high potential prospects. This is what we need to be measuring, combined with that the closing ratio of our high-value prospects. I’ve seen full adoption of this process result in two major outcomes. First is a higher closing ratio, and second is deals closing with higher revenue and profit. It’s time we focus on measuring what will make a difference to our top-line and bottom-line and stop measuring activity. 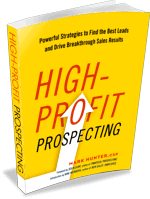 PrevPreviousThe Prospecting Sales Funnel — It’s a Broken Process!